Do a top level domain (.com, .net. org) have got more value over a free sub domain (.blogspot.com)? Are you a blogger? Just created the blog and want to move from "your blog.blogspot.com" to "your blog.COM". Well, as you may have already known, there are two types of domain on internet. So why people upgrade to a TLD (Top Level Domain) from a sub domain? Does it add more value to their websites? Yes it does, may be because people believe it do. Confusing? Don’t worry, keep reading? People believe that content on a website with TLD is more useful and more rich in quality then a website on a sub domain. But how true is that? Well, it’s absolutely true to some extent, because if someone is buying a TLD for his website then he is more likely to provide high quality content as no one will spend on content which is not worth. On the other hand, Sub domains are completely free for life time, so someone may use it just to hit a chance and just put in duplicate and copied content. But this not true all the time, as the above situation has other side too. A writer may have very high quality content and he has the confidence that he does not a TLD for his website and can do well on a sub domain. This saves his money which he was about to spent on buying a custom domain. But this other side has a faded chance. Possible reasons why one moves to a custom domain. 1. It gives your visitors an easy and short URL to remember. 2. It gives a professional look to your website and makes your website a brand. 3. You believe, moving to custom domain will increase your traffic. 4. 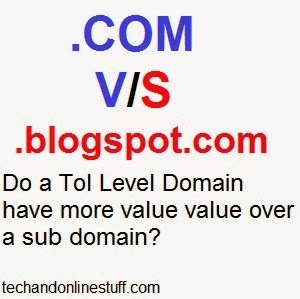 People believe Top Level Domains has more value over a sub domain. Does moving to a Top Level Domain increases search engine visibility? What affect a TLD has on Search Engine bots. Well, your possible question can be- Do search engine bots treat a website with TLD in a better way then a website which to not have top level domain. The answer is a BIG NO. A website with sub domain is equally likely to get listed in search results as a website with a TLD is. A search engine evaluates a website by the content on it and that’s all. Its not like a website with sub domain can never get higher rand then a website with TLD in search engine results instead I have ran a blog, hosted on a blogspot sub domain, which was at higher rank then most of the websites in the same niche. What Google Adsense thinks of top level domains. Now, the case here is different, a website with top level domain seems to have got an upper hand in Google Adsense approval stage. You may be wondering why the difference in behavior as Adsense is also operated with help of bots. This not at all contradicts what we have learnt about search engine bots. The difference is because Google Adsense is a service for people. It has to select those websites which are liked by the people and people believe that TLD websites has got more value, and hence Adsense also thinks that TLD websites has got more value. But if you have got unique and useful content that no other site have, then whatever the domain is, it will not matter as a person will find the information related to your unique topic at nit other site. We believe in God, God is all mighty. People believe top level domain has got more value so it does. Whether to build a website or blog it is essential to name them properly. Choice of domain extensions and names simply defines what your site is all about. This is a fact that without an accurate name brand building becomes quite difficult even if you have good quality content or information. I like the point you have mentioned in your blog, just like to add that whatever you choose it should be precise, short, easy to read and remember.